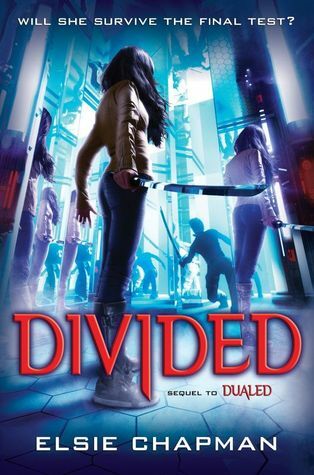 Divided, by Elsie Chapman, is the second book in a YA series. I have not read book one (Dualed), though a sampler was provided by the publisher, through NetGalley, which did give me a little taste of what the series would be about. What we have is a future/alternate world in which a community is controlled by a corrupt governing board. All children are born with a genetic alternate (“Alt”) twin. To become ‘complete’ each youth must kill their Alt. This insures that the children who succeed will grow up to be battle-tested and strong enough to be good members of society (survival of the fittest). It would seem that our heroine, fifteen year old West Grayer, has already succeeded in killing her Alt and is hoping to move on with her life. But some members of that board have other thoughts, needing West to assist in the elimination of other Alts. She balks, but is made some promises which put her on a path she’s never comfortable moving along. When one of the Alts she’s been assigned to eliminate turns out to be someone she recognizes…someone who is NOT an Alt but a ‘Complete’ … she knows she’s been set up. Failure to follow through on her assignment means the board has issued a reward for her death. West has to survive, and get some answers. The book is pure teenage girl YA; filled with anger, angst, confusion, love, betrayal. I’m pretty sure these are the ingredients necessary to make a classic YA book, and we definitely have them here. West can’t wait to start her private life with her boyfriend Chord, and while she’s already planning having children with Chord, she hides everything from him. She doesn’t tell him what she’s doing, or why. But of course that’s part of the YA-ness here…the fifteen-year-old making mistakes and not trusting in the right people, and thinking she can handle it all on her own. West is a well-defined, though clearly flawed, character. (Flawed is okay…we’re all flawed.) Chord is a bit of a patsy. He clearly cares about West and is willing to do anything he can to support her. Including not asking too many questions when he knows he won’t get answers from her anyway. The board members we meet are all appropriately slimy and grouchy government types. Other friends and persons we come in contact with are generally not particularly memorable but serve their purpose and no one strikes me as poorly created, just not full of depth. The story is very unique. I read a lot of sci-fi/fantasy/YA and I don’t recall a theme quite like this. It’s perfect for a YA book…I love the idea of survival of the fittest by the necessity of killing your own twin. How perfectly manipulative! And the reason West is asked to do the additional ‘strikes’ also comes across as very believable in this world, but what West learns in the process not only throws open the door wide for another book, but really helps identify what sort of world we are in and what West and Chord might have to deal with. There’s plenty of action, including an obligatory sword fight! West is well-trained and the fighting action really keeps the story moving along quickly. And while I enjoyed the book, there’s something just a little bit hollow inside of me. I don’t know that I will take any of this book with me once I close the pages and finish this review. I wasn’t particularly attached to anyone here, and while I very much like the new-ness of the concept and the creation of the characters, this will never reach too high on my favorite books lists. I will rate it well (3.5) and I can definitely see where it will get a decent fan base, but it falls short when compared to other books I’ve read recently in the same genre. It just lacked that little extra ‘kick’ for me. Looking for a good book? Divided by Elsie Chapman has all the ingredients for a superb, classic YA book and keeps the door open for book three in the Dualed series. If you’ve done any research on this book…reading reviews on blogs or on Goodreads…you’ll know that there are an awful lot of people really moved by this book. I’m here to add my two cents worth and tell you it’s all true. Ove is the curmudeonliest curmudgeon on the planet. He is the old man down the street whose yard you didn’t walk across when you were a kid. He is the neighbor who watches from behind the chained door as you walk down the hall of your apartment or condominium. We all know an Ove. But we don’t all know what makes an Ove. This book not only looks at the creating of a curmudgeon, but it also helps us empathize with the life of someone who is constantly cranky. Ove is an old man, living alone. He’s a ‘by-the-book’ sort of guy, living a black and white life in a world full of color. One of the very few things he’d ever done that took him out of his comfort zone, was meeting and marrying a beautiful young woman who could see through his rigid exterior to his heart. She is the ‘L’ to his ‘Ove’ – making him complete. But as we meet Ove, his wife of forty years has passed away and he’s been forced in to retirement. There are burglars in the neighborhood and new neighbors who don’t seem to know how to do the simplest of things (such as back up a vehicle with a trailer). 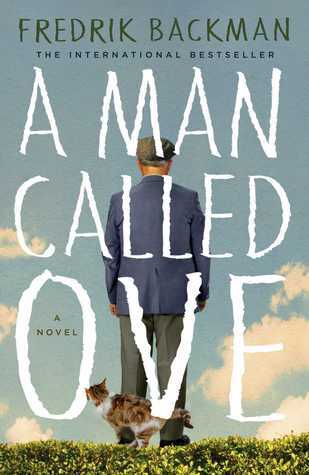 Author Fredrik Backman successfully makes Ove a real person and someone who the reader can relate to, or at least understand and empathize with. And once he’s done that, he lets us in on Ove’s secret, which may surprise some readers. Backman also touches … no … tugs on our hearts. Somehow, Backman makes one of the most cantankerous curmudgeons in literature a symbol of love and hope and the feel-good character of the year. Maybe there’s a bit of Ove in all of us. I know I was a bit Ove-like before reading the book. I’d seen the reviews and high ratings on Goodreads and thought that there was no way it could really be such a feel-good book, and I began with a “prove it to me” attitude. With that mind-set going in, it took me a little longer, perhaps, than most, but I did succumb to the gentle beauty of the book. I think you will, too. Looking for a good book? This is it. If you read only one book this year, or you want that perfect book to read on the beach, this should be your first choice. I’ve been familiar with Joe R. Lansdale through his short fiction, which has always impressed me, but for whatever strange reasons of fate, I’d never read any of his novels. When this book came across the ARC pile, I quickly requested it. It does NOT disappoint! The book is being reissued because of the new movie that has hit the film festival circuit and should be available for the public about the time this review is published. We start right out with an ordinary man, Richard Dane, who, protecting his family, shoots and kills an intruder in his home. Racked with guilt over taking a life, Dane seeks out Ben Russel, the intruder’s father, despite the police’s urging him to leave the Russel family alone. From that point on, Dane is bound up in a mystery racked with corruption and lies and brutality. Dane steps out of his ordinary life to see closure to the story. Author Joe R. Lansdale does an excellent job of keeping the reader off-balance, tilting the story, or the characters, just enough to shake things up when the reader might otherwise start to settle in. And the further we go, the scarier and eerier it gets and there is the very real possibility that Dane will not get out of this. Lansdale writes very real people. Everyone here, even those who have such a small appearance in the book, appear to be real people and not just a name. Richard Dane is us. He is ‘Everyman.’ He is also, clearly, the lynchpin which holds this story together. Those around him, his family, Ben Russel, and private investigator Jim Bob Luke (one of the most colorful characters I’ve read in a long time) pull Dane in different directions, creating complications to his otherwise routine (and safe) life. And just as the people appear real, so does the setting. Though I haven’t spent any significant time in East Texas, I almost feel as though I’ve been there, just based on what I’ve read here. This book is hard-boiled crime fiction. It is pulp fiction. Both terms often have a negative connotation to those who aren’t familiar with the genres, but this is crime fiction/pulp fiction at its best. It is dark, it is dangerous, it is wickedly humorous, and it is a good read. So why not five stars? Because for me, there was one issue that I couldn’t get over. Dane makes a decision…one decision…that really puts him over the edge. And while Lansdale does everything possible to set this up and explain Dane’s motives for the decision, I don’t quite buy in to it. I accept it for the sake of the story, but it doesn’t quite ring true and spoils the results for me. Fortunately, Lansdale writes so incredibly well that we can forgive the moment and keep ourselves wrapped up in the gritty story. Looking for a good book? 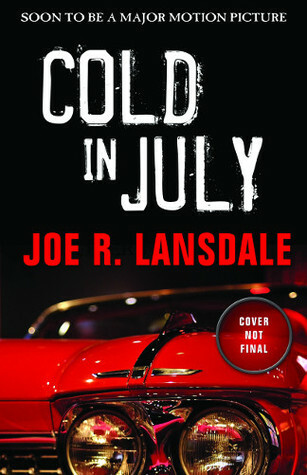 Cold in July is a great read (or even re-read) for anyone who loves hard-boiled, dark mysteries, crime fiction or pulp fiction. It’s a great summer read. It will surprise some people that I’m very very new to the whole Dresden Files stories. I have not read the entire series, and I have not watched any of the television episodes. What I have read, however, has been truly wonderful and I want to dig in to all the books (but I’m still way behind on my ARC reading, so it’ll be a little bit). 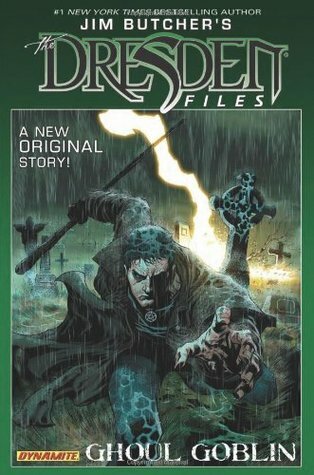 So when I saw the opportunity to read a graphic novel based on Jim Butcher’s Dresden Files, I thought this would be a great chance for me to get in a little bit of everything I enjoy. The story is fairly straight-forward for someone who deals with ghouls and vampires and werewolves on a daily basis. Harry Dresden is called to a small town by a deputy sheriff to investigate some unique deaths of family members. The sheriff doesn’t want Harry Dresden around and isn’t happy with his deputy. However, the deputy is correct … there is something supernatural going on and Harry reveals a curse on the family from a long time ago. There are battles with supernatural creatures and all sorts of the usual Harry Dresden dry commentary. All in all, a fun, visual Harry Dresden story. One of the most difficult things about doing a comic book or graphic novel of existing literary characters is drawing what we readers have imagined in our heads. So rarely will any two people have the same idea as to how someone looks. Occasionally a visual format will appear so well that it becomes the commonly accepted representation. Look at Conan the Barbarian. He will forever look to me as Frazetta and Buscema have imagined him. The hobbits of Tolkien looked only the way the Hildebrandt’s have painted them, and now the way Peter Jackson has put them on-screen. Will Sookie Stackhouse look like anything other than Anna Paquin? Will Alice ever really look like anything other than the drawings of Sir John Tenniel? But for every literary character that holds a common visual appearance, there are hundreds more who are constantly drawn or depicted but aren’t accepted as ‘the’ look and Harry Dresden is one of the characters for me. I haven’t seen the Harry Dresden yet who appears quite how I imagined him based on what I’ve read. The covers by Ardian Syaf are very very close, but the interior art, by Joseph Cooper don’t work for me at all. As a story, I am very happy reading this and could have read it as just a story in a magazine or collection, without pictures, and been very content. But as it’s a graphic novel, the art is important and can’t be ignored. There’s some technical mastery in the work, with some solid inking, but the art is generally a bit too ‘cartoony’ for me, for a story that is dark and devilish. The faces are a little too exaggerated. Harry looks like a caricature of who he should be and I have difficulty taking him seriously most of the time in the book. There are pages, or at least panels, where he looks true and serious, and I like these (page 33 of my digital edition [which may include the cover as a page] looks very good — as if it wasn’t even drawn by the same artist!). The monsters Harry fights are foppish, Scooby-Doo-like creatures rather than frightening ghouls and goblins. It’s become commonplace for graphic novels to include ‘bonus material’ and this book is no exception. There are sketches of the characters, character descriptions, and sample pages of the script. Looking for a good book? It’s fun to read a new Harry Dresden/Dresden Files story, but the art in this graphic novel doesn’t live up to Harry’s stature. For how much longer can we get mileage out of The Beatles? For quite awhile is my guess, based on the number of books that continue to be released about the remarkable, iconic group. And as long as the books are well-written, strongly-themed and have something unique to say, then those books will continue to be welcomed. This is such a book. The Beatles Are Here! is not so much a book about the Beatles themselves, but a reflection on the effect the Beatles had on our society, by way of the effect on individuals. This book contains a number of short essays from a mix of people, recollecting their introduction to the Beatles’ music or appearance. The vast majority of these essays are very well written and insightful. Just a very few essays lacked merit and typically those were by people with ‘name’ recognition. I did wonder what the point of their inclusion might be. Is it possible that editor Rowlands or the publisher had committed to the works before they were written? Is it possible that they were included in order to help sell the book based on the essayists name? Anything is possible, of course. But really, this book doesn’t need ‘name’ authors to sell it. The quality of most of the work here, and editor Penelope Rowlands’ insightful placement of the essays holds its own and reads very well. Although the bulk of the essays are unrelated (other than the obvious connection to the Beatles), there is a really nice, quite fascinating connection/correlation between a few of the essays. If you take a moment to look at the photo on the cover of the book, you’ll see a rather iconic photograph of a group of teenaged girls behind a homemade banner proclaiming “Beatles Please Stay Here 4-Ever.” The girls are enthralled, screaming, reaching out. This is often how we picture the early days of the Beatles, especially in America … with teenage girls screaming and crying. That same photo inspired a piece by Gay Talese in the New York Times, September 21, 1964 (included in this book). The girl dead center, screaming, is Penelope Rowlands, editor of this collection. Through the magic of the internet, most of the girls centered in the photograph have reunited and contributed an essay to the book. Fascinatingly, none of them seemed to know each other before (or since) the photo was taken, but were brought together once by their love of the Beatles, and again by the circulation of the photograph. The essays of these girls (now women) are among the most interesting. Rowlands sprinkles these essays throughout the book, rather than lumping them all together, which works quite well as, unless the essay is written by someone with a recognizable name, we are not sure if an essay is by someone connected to the photo or not. It was a small, brilliant method of giving the reader just a touch of mystery. Among those essays connected with the photo is a compelling essay by the photographer who took the picture, Henry Grossman, who travelled with the Beatles. This makes perfect sense, and I wonder why I haven’t read this, this succinct, before. I’m not sure that there’s much new to be learned about the Beatles themselves, or even their music, but this book clearly shows that we can still learn about the effect that the Beatles (and their music) had on our society which was ripe for that which the Beatles provided. Looking for a good book? Whether you’re a fan of the Beatles, pop music, pop culture, or even social studies of the 1960’s, The Beatles Are Here! is a remarkable, compelling book and highly recommended. I was delighted to get this Gail Z. Martin book as I had never read anything by Martin prior to this. 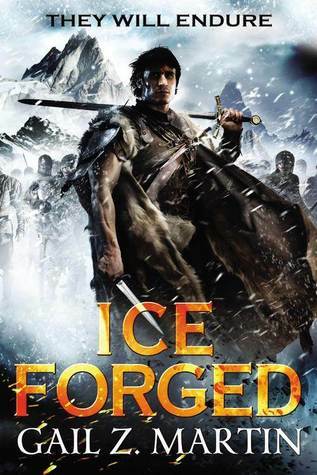 This book, Ice Forged, appears to be the first in a new series by Martin. The book starts with a young nobleman, Blaine McFadden, who kills his abusive father. Such an act would normally have him executed, but the King of Donderath, knowing of the elder McFadden’s ways, takes pity on Blaine and banishes him to the penal colony, Edgeland. Such banishment is akin to death as life in the far-away land of snow and ice is rough. Blaine, however, is that type of person who can overcome any obstacle. After changing his name to “Mick” to avoid any problems with his previous stature, Blaine/Mick builds a quality life for himself and for many of the others who had been banished to the land. When supply ships from Donderath stopped coming to Edgeland, Blaine/Mick and others fear the worst for their former homeland and set out to restore the balance of nature/power in Donderath, supposing that whatever befell Donderath could happen elsewhere as well. What has happened, of course, is war. A rival king, King of Meroven, has unleashed the full power of his mages, an act so daring and desperate that no other king has ever done this before. One result of the war is the loss of every-day magic … that simple, earth-borne magic that everyone can tap in to to help crops grow or to help reduce fever quicker, etc. And with the loss of this magic, everyone suffers. Blaine/Mick and his associates return to Donderath to join forces with some of Blaine/Mick’s old comrades, to restore order. The book is one of the more interesting fantasy concepts that I’ve read. While there is clearly a sword and sorcery element here, it never felt ‘typical.’ I’ve read so many books that are nothing more than rehashes of Robert E. Howard or J.R.R. Tolkien and the like. Martin’s world felt very different … a step up in the history of the modern world. (Think that transitory period between the Iron Age and the Roman Age, as opposed to the Bronze Age.) These aren’t intelligent savages hacking and slashing their way through the world, these are civilized men and women in a world of war, agriculture, and magic. Like most epic/quest books, we mostly follow the exploits of one particular individual. Here it is Blaine “Mick” McFadden. While Blaine is a decent, strong character, I have a little problem with how easily everything seems to come to Blaine. He never really seems to have to struggle for anything. Starting right off with his killing of his father, he should have been sentenced to death and had to fight for his life (literally), but instead he’s banished. He should have to fight for his life in the savage wasteland of Edgeland, and perhaps he does, but we never see it. Instead we return to him to find that he’s living somewhat luxuriously with a ranch/plantation, and a solid crew of friends/followers. Upon his return to Donderath, after a decade or so away, he walks in to his old home and mostly picks up right where he left off, able to secure good food, wealth, weapons, and friends. When he needs some powerful, magical allies, they come to him. For a character-driven novel, the characters do not have the hurdles or struggles that they need to be truly compelling. I’ve often found that a book of more than 400 pages (this is nearly 600) too often tends to fail to sustain a high drive and keep my interest. This book was no exception. If one is going to write something this epic, keeping me turning the pages everyday is challenging. I occasionally stopped caring about what Blaine was going to do next and would put the book down for a day or two at a time. There were moments that were completely compelling, but nearly as many that I just wanted to rush through. One aspect that I’m still not quite sure how I feel about … vampires. Yes, vampires. There are vampires in this book. I like vampires as characters. But I’m not sure I like them appearing, out of the mist (so to speak), two-thirds of the way through a fantasy/mystery/quest epic. As a potentially game-changing character, I felt it was a rather cheap shot. A dark deus-ex-machina. And yet…well…it’s a fantasy world with vampires who aren’t the main focus of the book. That’s kind of cool. But…well…introducing this power this late in the game? Yeah…conflicting emotions. Despite these criticisms, I am impressed with the world-building. It’s a rather unique fantasy world, and that is harder and harder to accomplish. The characters are well-defined, even if their challenges and obstacles are not. I look forward to the next book, and possibly even reading some of Martin’s other works as time permits. Looking for a good book? Ice Forged is an epic fantasy with remarkable world-building and well-created characters that need to be challenged a bit more and asked to do more on their own. Looking For a Good Book will be on vacation and not posting next week. Look for us to return June 23! Thanks for reading!